Weird. VERY weird. Not bad, mind you, just... weird. This will sound unrelated when I first mention this, but there's a reason why I briefly provide this fact: before I ever saw this cartoon, I had slipped in a bathtub and banged my forehead against its rim. I was alright, but I would spend the next couple of days or so lying groggily on a couch with the TV on with an ice pack on my head. 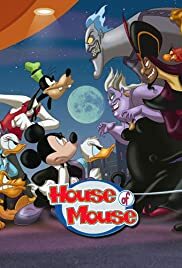 During the first day of doing so, Toon Disney just happened to be showing a 9-hour marathon of a cartoon I have never seen before called "House of Mouse". Since nothing else was on and I couldn't move, I watched it. For the first couple of hours or so, I couldn't help thinking, "Is this a hallucination brought on by my accident or am I *really* watching this?" Hence the reason I mention my injury. I got that thought wandering through my mind simply because the show seemed so... strange. Not bad, mind you, it was certainly fun to watch. Just... strange. It basically strikes me as being a sort of combination of Mouse Works and "Cartoon Planet" from the Cartoon Network during the mid-'90s. Its cartoons, more often than not, are brand new ones with surprisingly fresh gag ideas and genuinely funny moments. But for some odd reason, the whole thing still left me hollow. Part of that reason, I think, is because the show is advertised as "so many Disney cartoon stars in one place! ", yet that concept only turns out to be fancy window-dressing for what is otherwise an essentially yet-another-run-of-the-mill cartoon anthology, although the cartoons it features are done very well. The idea is not explored anywhere near as much as it could have been, which is a genuine shame. Also, this cartoon has one speed: fast-forward. It whizzes by to such a degree that a lot of the images simply do not "read" (for those of you who aren't familiar with the term, we in the animation industry use the word to refer to how easily the human eye can register what's being shown on the screen) too terribly well. It's not as bad a problem as it was in the atrocious "Cool World" (a film still guaranteed to give first-time viewers a massive headache and nausea from mental overload--and no, I don't mean that jokingly, I'm being serious), but it's still a bit much. Even so, the show is better than many of the cartoons currently being offered elsewhere. It's a disappointment that its main idea isn't explored more thoroughly, though--I personally think that they should dive into the other characters' interacting and all much more thoroughly and effectively and not focus so much on the actual cartoon shorts, otherwise everything else comes across as gimmicky filler. Also, some new cartoon shorts starring the actual characters *in* the audience as opposed to merely Mickey, Donald, Goofy, etc. would be a refreshing change of pace and much more entertaining. As it currently is, "House of Mouse" is sort of like eating a large cheap sweet roll when you aren't able at that moment to enjoy a full breakfast--it isn't particularly tasty, isn't particularly healthy or satisfying, but it just sort of temporarily fills you up a bit for the time being until you get to eat the real thing.